Snow White and the Huntsman is Snow White’s second trip to box office this year. This time, she’s dropping the Enchanted meets bad Jennifer Aniston gimmick and adopting more of a Lord of the Rings look. Will it work to the film’s detriment or success? Let’s find out. A very fair woman named Ravenna (Charlize Theron) becomes the Queen and ends up killing the king shortly after marrying him. Many years later, the Queen has become older & maintains her beauty by various methods, including the use of supernatural powers to drain the beauty out of those who could surpass her beauty. Once she learns that Snow White (Kristen Stewart) has not only become the fairest in the land but holds the key to immortality, she becomes determined to kill Snow White to gain it. The Queen eventually becomes desperate and forcibly bribes a Huntsman (Chris Hemsworth) in leading her troops to bring Snow White to her. 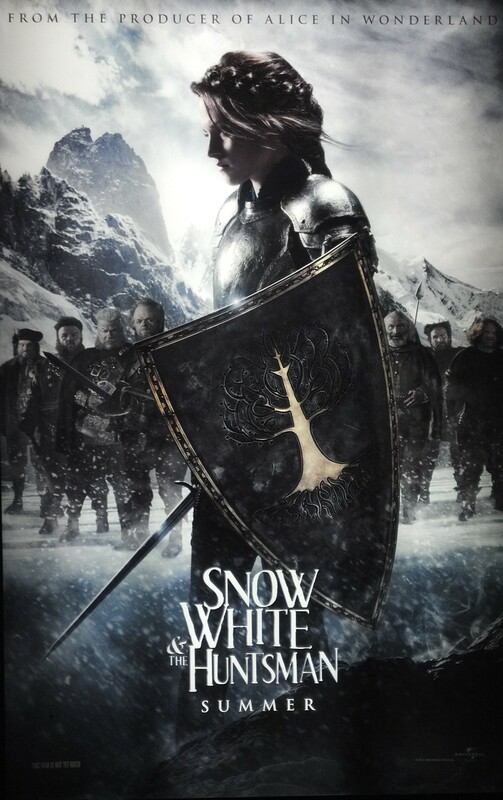 Once the Huntsman learns that the Queen cannot deliver, he decides to protect Snow White from the Queen’s pursuing forces. Snow White and the Huntsman takes the fairy tale on a couple of really interesting turns. The way that she is poisoned was quite surprising yet makes sense if you pay close attention in the beginning of the movie. In addition, the movie captures very beautiful landscapes in a style similar to The Lord of the Rings trilogy in certain scenes. The treatment of the seven dwarves is also a highlight of the movie. Whether they were assisting Snow White or bringing the comic relief, you’ll be happy to know that these dwarves were far from dopey.